This collection consists of records relating to Nancy Bekavac and Marjorie Craig Benton both of whom served as Chair of the President’s Commission on White House Fellowships. 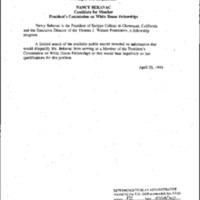 The records contain correspondence between the President and Nancy Bekavac on issues related to White House Fellows. 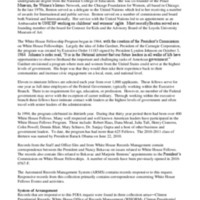 The records also contain files related to Bekavac and Marjorie Bentons’ appointments to the President’s Commission on White House Fellowships.